After Dinner Amusements offer a fun little twist on classic party games. Each miniature deck of cards is packaged in a full-colour decorative tin box, charmingly evoking the look of after dinner mints! Compact and eye-catching, they’re the perfect pocket-sised games to bring to any party and to add on to any gift. The Get Smart game features 50 brain-busting trivia questions covering a range of subjects from history and geography to literature, pop-culture, and more. Perfect for an unforgettable after-dinner duel between friends and family! 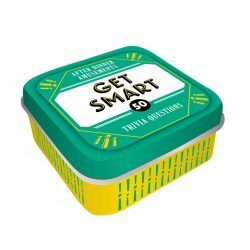 For 2 or more players, ages 12 and up, this season, we launch with four games:–Get Smart: 50 Trivia Questions–Do You Remember? : 50 Questions to Share Memories–Truth or Dare for Couples: 50 Questions and 50 Challenges–Family Time: 50 Conversation Starters. A unique, Futurist-inspired version of the quick-draw Rock, Paper, Scissors game with illustrations by Mads Berg. The pack contains 40 playing cards and one explanatory instruction card. The twist? There are also four special ‘BOMB’ cards which beat all the other cards! 75 cards. Over 200 conversation openers. Take talking to the next level. The authors of the popular What to Talk About have returned to help banish awkward silences and inspire better conversations. This handy deck is packed with funny and fresh ideas for both small talk and deep discussions. Let the conversation begin!